This premium Rich Facial Cream contains carefully selected plant-based ingredients. It spreads easily and absorbs quickly, providing an abundance of nourishment. It soothes dry, sensitive skin and adds moisture to help keep the skin supple, healthy and youthful in appearance. 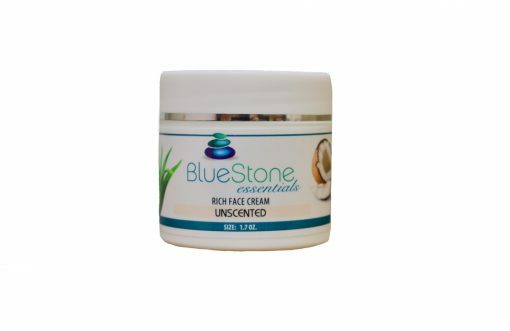 Rich Facial Cream is a unique scent-free formulation with a combination of bio-degradable fatty acids, derived from olive oil, which are very similar to the surface of the skin, and makes this creme deeply moisturizing. The excellent spreadability will leave the skin feeling silky and smooth to the touch. Ingredients: Water (Aua), Aloe Barbadensis Leaf Juice, Cocos Nucifera (Coconut) Oil, Glycerol Monostearate, Glycerin, Cetearyl Olivate, Sorbitan Olivate, Cetyl Stearyl Alcohol, Phenoxyethanol, Linium Usitatissium (Flax) Extract, Hydrolyzed Rice Protein, Ethylhexylglycerin. This gentle cream deeply absorbs into the skin leaving the surface soft, supple and primed for any make-up application. That said I find myself wearing face make-up less and less as this cream has created a smooth, healthy palette. Prior to initial use, my skin began to feel like sandpaper and for approximately 5 years I had a rough patch near the left cheekbone area. Although the Dermatologist assured me is was not skin cancer, having had a parent who suffered melanoma on the face, the un-certainty remained. Having now completed my first jar of Rich Face Cream the ‘cheekbone patch’ is completely gone while the entire face and neck area feel nourished, calm with no signs of irritation!